and Let Us Include It on The Web Site! I started this website back in 2003, after making my trip back to Mississippi and Georgia and meeting so many of you wonderful McMullan kinfolk! I wanted to put together a website that would be a place where people could get come and learn about their family history. Capt. Albert McMullan's book was out there but as many of you know, his book is full of mistakes and not all the family lines are there. He did a great job with what he had at the time but we can do better with everything we have now. I am asking all of you McMullan's and McMullan relatives to help me make this the best McMullan resource on the Web. I need copies of your photos and family stories to put on here. Email them to me and if you don't hear from me, keep at me. Sometimes I miss an email here and there. If you have ideas for the website, I am open to that too. If you think of ways that the site can run more smoothly, let me know! And if you are ever in the Orlando, Florida area, let me know, I'd love to meet you! Patrick (Sr) McMullan's grave has been FOUND! 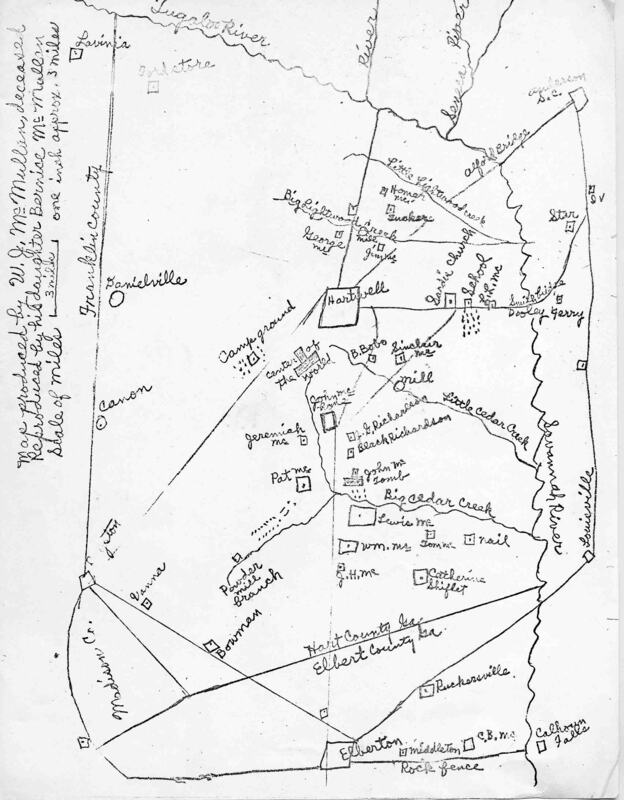 In my trip back to Mississippi and Georgia, in search of my grandfathers, Bonnie McMullan gave me a hand drawn map of the burial site of John McMullan. I sent a copy of the map to Will Carter in Hartwell, Georgia. I got an E-Mail from Will later on telling me that he has found Patrick's grave!!! Click Here to read the whole story with photos! As time passes, unfortunately much of our family's history does too. Many of us that can trace our lineage back to John McMullan have had the opportunity to study the book," McMullan and Allied Familes" by Capt. Albert McMullan. I am thankful for the time that our cousin Albert devoted to the book but it must be known that it contains many errors. The first errors I encountered were in my family line. As I have gotten acquainted with more of our family members, I have learned of many more errors. Although I would like to believe that John McMullan made George Washington's first uniform as Commander-in-Chief, there is just no proof that this ever occurred nor is there any evidence that John was ever a tailor. Another story is that John's first wife, Theodosia died sometime after John entered into service in the Revolutionary War. This, sadly, is not true either. Theodosia married a William Dula and they had children born to this union after John's wartime service. Thankfully, we have some family members who are committed to finding out the truth about our family. All of us will gain from this effort. Gale Fuller of Huntsville, Alabama is trying to coordinate an effort to put together as much "proof" about family members and events as is humanly possible. If you would like to help Gale, please drop her a line at GaleFuller@aol.com. In the early 1990's, I began to take an interest in my family's history. I knew that many of the McMullan's had come from and still lived in Newton and Decatur, Mississippi. Researching this, I contacted Milton McMullan of Newton, Mississippi and he mailed me a copy of Captain McMullan's book. I am deeply grateful to Milton, who has since passed, for sending me the copy of the book and I am also grateful to Captain McMullan for doing the research on the McMullan family and putting it in print for the McMullan family. Again, in late 2002, I began to take more interest in finding out more about my family's heritage. Captain McMullan's book had a somewhat incomplete history in my line of the family so I decided to correct the mistakes. As I began to read through the book, I began to see how terribly hard it was to follow the lineage of the families in the book. Because of the difficulty, I decided to put the information in the book into a computer file. A few months later, I completed entering all of the data into a Family Tree Maker file. Through many of the online web sites, Ancestry.com, Genealogy.com, Rootsweb.com, etc., I was able to contact other distant family members. They have been so helpful in finding information on the McMullan family and in helping to correct some of the mistakes that are in the McMullan book. With the help of many distant relatives, I am able to offer the GEDCOM file of the McMullan family history to the McMullan family. This is truly my gift to my living relatives and to my ancestors who have gone on before me. I can remember the hours I would talk to my Grandfather, Hubert Newton McMullan. He truly did live in a different world when he was my age. I only wish I would have had many more years to sit and listen to the stories of his life and to the many other Grandparents, Great Uncles and Great Aunts. If you are a descendent of John McMullan's, I need your help. I would like to make this file the most complete file available for any family in the world. It is my wish that each and every McMullan or any other person that has a tie to the family will be able to quickly and easily see where they came from. If you have family photos, stories or family documents that can be added to this file, please make them available to me and the rest of the McMullan family. I do not wish to capitalize by making this file available. It will be available at cost or, if you send me a blank CD with the necessary return postage, I will send you a copy of the file and all the photos and documents that I have. As I add more photos and information, the file will obviously change. Because of this, I will give each revision a new revision number. To see which revision is the most current, look at the top right corner of this web site. You may also download the GEDCOM file which is much smaller in size, from this web site. It will not contain photos and copies of family documents. The Family Tree Maker file is too large to be available at this site. Thank you for your help and may God continue to bless the McMullan family! and many other volunteers and genealogy societies in Texas, Georgia and Mississippi! This is a personally owned and operated website. It has been developed for the enjoyment of the descendents of John McMullan. You are free to use the information and images (unless otherwise specified) contained therein for your personal entertainment and enjoyment. Use of any material on this website for any other purpose must have the expressed, written permission of Jay S. McMullan and/or his assignees.